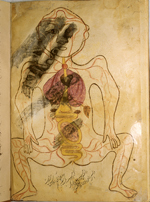 No anatomical illustrations of the entire human body are preserved from the Islamic world before those which accompany the Persian treatise composed by Mansur ibn Muhammad ibn Ahmad ibn Yusuf ibn Ilyas, who came from a Persian family of scholars and physicians working in the city of Shiraz. 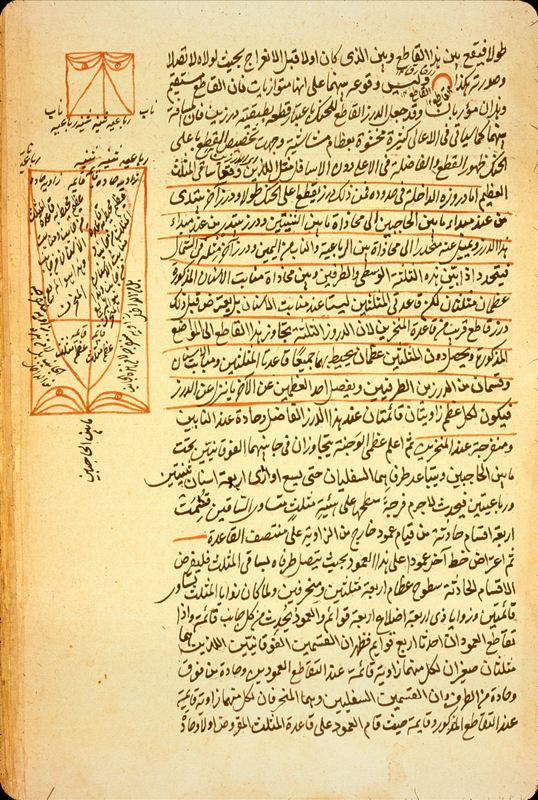 His illustrated treatise, often called Mansur's Anatomy (Tashrīḥ-i Mansur-i), was dedicated to the sultan Ziyā’ al-Dīn Pir Muḥammad Bahadur, in all likelihood referring to Pir Muḥammad ibn ‘Umar ibn Timur, the ruler of the Persian province of Fars from 1394 to 1409 (797-811 H) and grandson of Timur, known to Europeans as Tamerlane. 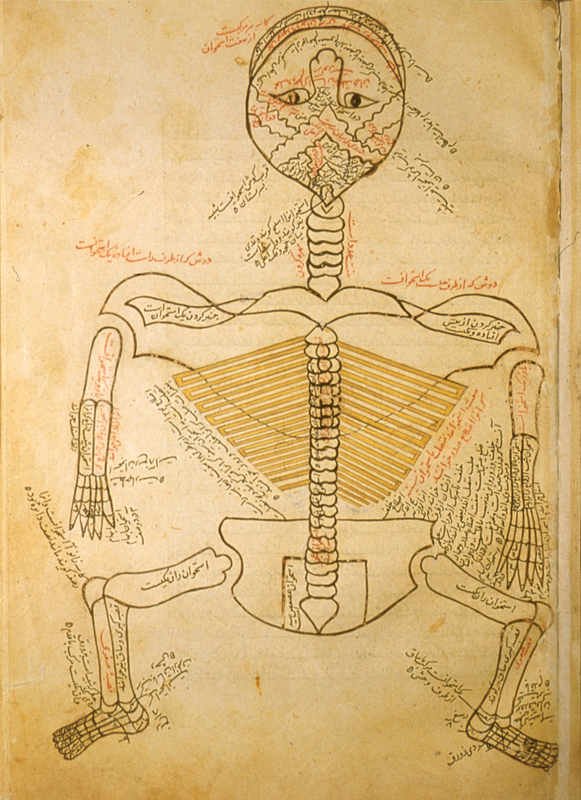 The treatise consists of an introduction followed by five chapters on the five "systems" of the body: bones, nerves, muscles, veins, and arteries - each illustrated with a full-page diagram. The chapter on the skeleton was also illustrated with smaller diagrams of the cranial sutures and bones of the upper jaw with the positions of the teeth indicated. 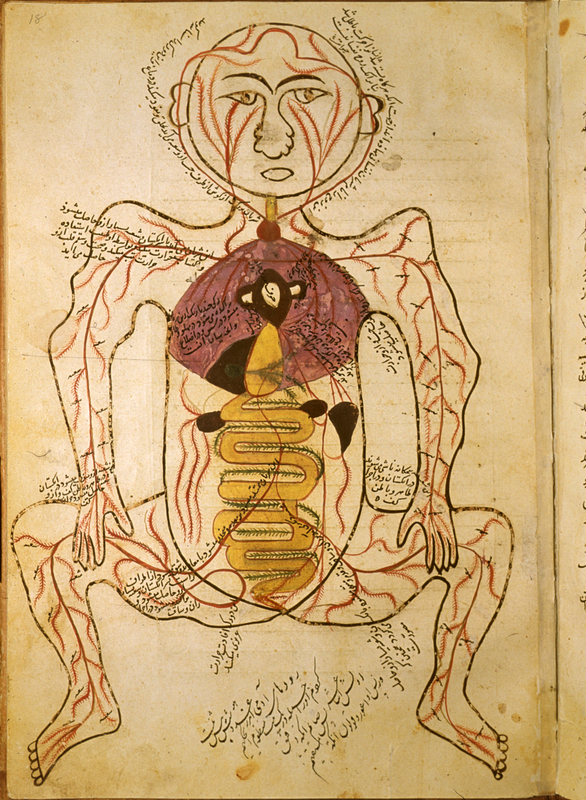 A concluding chapter on compound organs, such as the heart and brain, and on the formation of the foetus, was illustrated with a diagram showing a pregnant woman. The full-length illustrations (with the exception of the pregnant woman) have numerous labels in a mixture of Arabic and Persian. 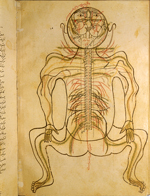 One of the two copies now at the National Library of Medicine is the earliest dated copy of Manṣūr ibn Ilyās's illustrated anatomy. 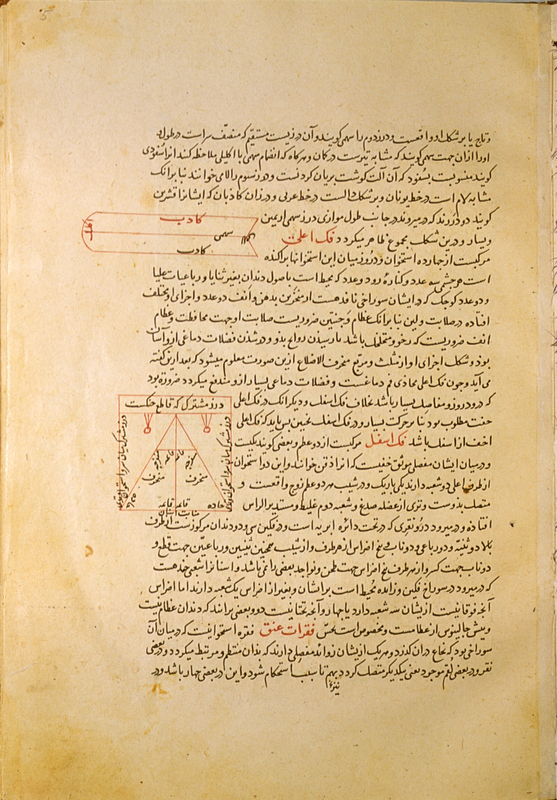 It (MS P 18) was completed on 8 December 1488 (4 Muharram 894 H) by a scribe named Ḥasan ibn Aḥmad working in Isfahan. Whether the scribe also executed the illustrations as well as copying the accompanying text is unknown. 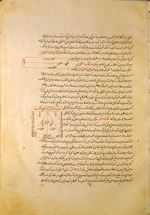 The second copy at NLM (MS P 19) is undated and unsigned, but the nature of the paper, ink, and script suggests that it was executed in the late 15th or very early 16th century, also in Iran. Most of the illustrations that Manṣūr ibn Ilyās used to illustrate his treatise were not original with him. 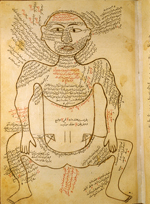 The origin of the anatomical series of full-length figures remains a puzzle, but it clearly predates the Persian treatise by Manṣūr ibn Ilyās written at the end of the 14th century. Historians have noted the similarity between the first five full-length illustrations and certain early Latin sets of anatomical diagrams. This similarity is particularly evident in the diagram of the skeleton which in both the Latin and Persian versions is viewed from behind, with the head hyperextended so that the face looks upward and with the palms of the hands facing towards the observer - a posture, some have noted, suggestive of a dissection table. All the figures are in a distinctive squatting posture. The earliest Latin version dates from the 12th century, yet the earliest Islamic version is represented by the NLM manuscript produced in 1488. We do not know in what form, nor by what means, these full-length anatomical diagrams of the five systems were available to Manṣūr ibn Ilyās. 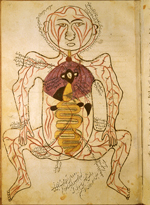 The sixth figure in the series of full-page illustrations, the pregnant woman, was possibly a contribution by Ibn Ilyas himself, who was particularly concerned in his treatise with Aristotelian and Galenic embryological theories and their interaction with the tradition of Prophetic medicine. It was constructed from the arterial figure, with the labels removed and superimposed with an oval gravid uterus having the foetus in a breech or transverse position. The accompanying text of Manṣūr ibn Ilyās's treatise, however, gives no evidence for or against the suggestion that the sixth figure was his invention, for in the text itself the figure of a pregnant woman is never mentioned. The only reference in Manṣūr ibn Ilyās's treatise to an illustration occurs in the chapter on the nervous system, where it is mentioned that pairs of nerves are to be designated by certain colours. Nowhere else in the treatise does Manṣūr ibn Ilyās even mention illustrations accompanying his treatise. The small schematic diagrams of cranial sutures and bones of the upper jaw (maxilla) that also illustrate the chapter on the skeleton by Manṣūr ibn Ilyās are to be found in Arabic medical encyclopaedias composed several centuries earlier. 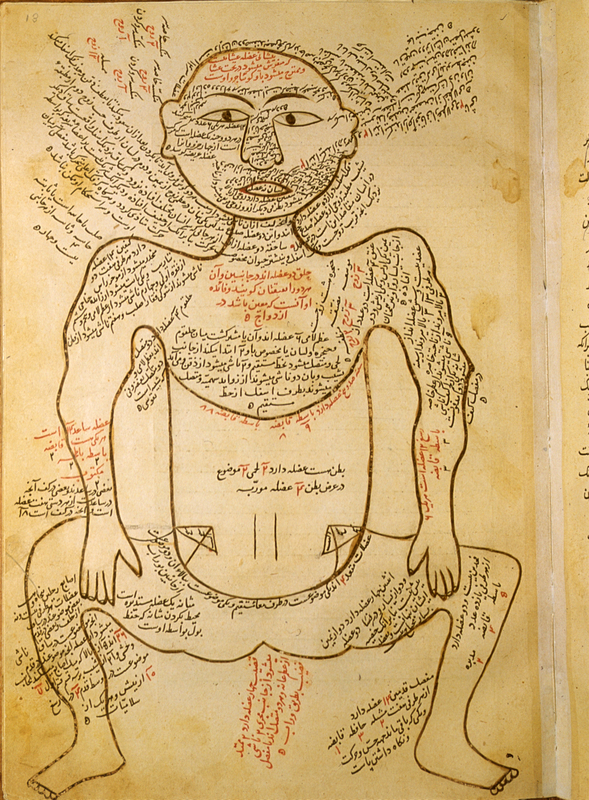 For example, copies of the Qānūn fī al-ṭibb (The Canon of Medicine) by Avicenna often have some of these diagrams in them; see MS A 53, fol. 11b detail, or MS A 62, fol. 60a for examples. 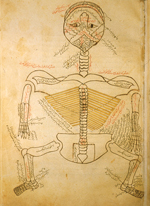 Over 70 sets of the Islamic full-page anatomical diagrams survive, of which about two-thirds are associated with copies of the treatise by Manṣūr ibn Ilyās. The remainder are more recent renderings, usually unlabelled, that circulated independently, with no accompanying text, or were inserted as illustrations into other treatises. For some of the preserved copies, see Storey PL II,2, pp. 225-7; Richter-Bernburg, "UCLA", pp. 46-53; Keshavarz, "Wellcome", pp. 340-2; and F.R. Maddison and E. Savage-Smith, Science, Tools, and Magic [Khalili Collection of Islamic Art, 12] (Oxford: Oxford University Press and London: Azimuth Editions, 1996), vol. 1, pp. 18-23. See also, the article "Eben Elyas" by Gül Russell in EncIr, vol. 8, pp. 16-20; and Andrew J. Newman, "Tashrih-i Mansuri: Human anatomy between the Galenic and Prophetical Medical Traditions", pp. 253-271 in La science dans le monde iranien á l'époque islamique, ed. by Z. Vesel, H. Beikbaghban, and B. Thierry de Crussol des Espesse (Tehran: Institut Française de Recherche en Iran, 1998). The skeleton, viewed from behind with the head hyperextended so that the mouth is at the top of the page. The copy is undated and unsigned; probably 15th or early 16th-century. The nervous system, also viewed from the back with the head hyperextended. The pairs of nerves are indicated by inks of contrasting colours. An undated and unsigned copy, probably 15th or early 16th-century. The muscle figure, shown frontally, with extensive captions describing the muscles. An undated and unsigned copy, probably 15th or early 16th-century. 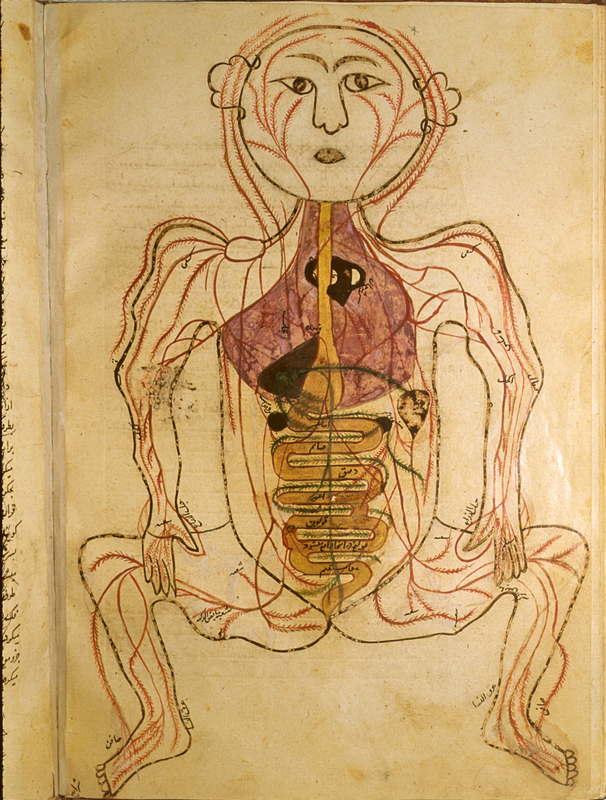 The venous system, with the figure drawn frontally and the internal organs indicated in opaque watercolors. An undated and unsigned copy, probably 15th or early 16th-century. 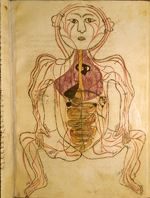 The arterial figure, shown frontally with the internal organs indicated in opaque watercolours. An undated and unsigned copy, probably 15th or early 16th-century. The figure of a pregnant woman. This is essentially the arterial figure on which a gravid uterus with the foetus in a breech or transverse position has been superimposed. The illustration is slightly defaced. An undated and unsigned copy, probably 15th or early 16th-century. A diagram of the cranial suture (upper illustration), drawn in red and black ink, and a schematic diagram of the bones of the upper jaw (maxilla) with the positions of the teeth indicated. An undated and unsigned copy, probably 15th or 16th century. Persian. 24 folios. Dimensions 26.1 x 18.0 cm; text area 17.8 x 11.2 cm; 27 lines per page. The title is given at the beginning of the text (folio 1b, line 20) and the author is named on the same folio (fol. 1b, lines 18-19). The dedicatee is given as Ziyā’ al-Dīn Amir-zadah Pir Muḥammad Bahadur Khan on fol. 1b, lines 25-26. The copy is undated and unsigned; the appearance of the paper, script, ink, and illustrations suggests a dating of the late 15th to very early 16th century. The text is written in a careful and precise naskh script in black ink with rubrications. There are catchwords and marginal corrections by the copyist and a few later marginal annotations. The paper is smooth, strong, opaque, fairly thick, and burnished; no laid or chain lines are visible. The edges have been trimmed from their original size. There are diagrams in red and black ink of the cranial sutures and upper jaw on fol. 5a; full-page illustrations in inks and opaque watercolors are on fol. 8a (skeleton), folio 11b (nerves), fol. 13a (muscles), fol. 16b (veins), fol. 18a (arteries), and fol. 24b (pregnant woman, slightly defaced). The binding is of 16-17th century Persian/Turkish provenance. It is bound in light brown leather over pasteboards with envelope flap. On each cover and the envelope flap there is a blind scalloped ovoid central medallion with pendants, decorated with twisted and tied cloud ribbon forms; there are frames of three blind double-fillets. Modern paper pastedowns and endpapers. Fol. 1a is blank except for five owners' stamps and three owners' notes, one dated 1146 (=1733-34). The manuscript was in the collection of the Army Medical Library by 1950. No further information is available on the provenance. Described in Schullian/Sommer. Cat. of incun. & MSS., 1950, p. 335, entry, with illustration of folio 8a in plate 12.